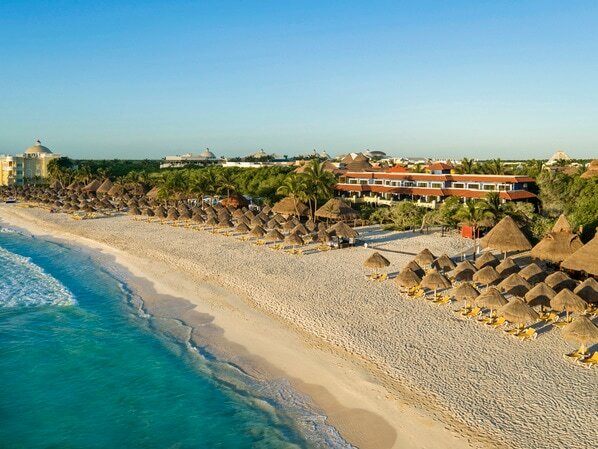 The Iberostar Paraiso Beach All Inclusive Riviera Maya is a 5-star all-inclusive family hotel with a distinctive Mexican colonial style. 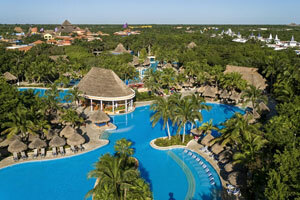 Iberostar Paraiso Beach is located in Playa Paraíso, the center of Mexico’s Mayan Riviera. The decor at Iberostar Paraiso Beach includes furnishings that are true works of art and the lobby is adorned with marvelous wooden carvings. The complimentary shuttle at Iberostar Paraiso Beach makes it easy for guests to travel throughout the resort, it runs on a regular basis. 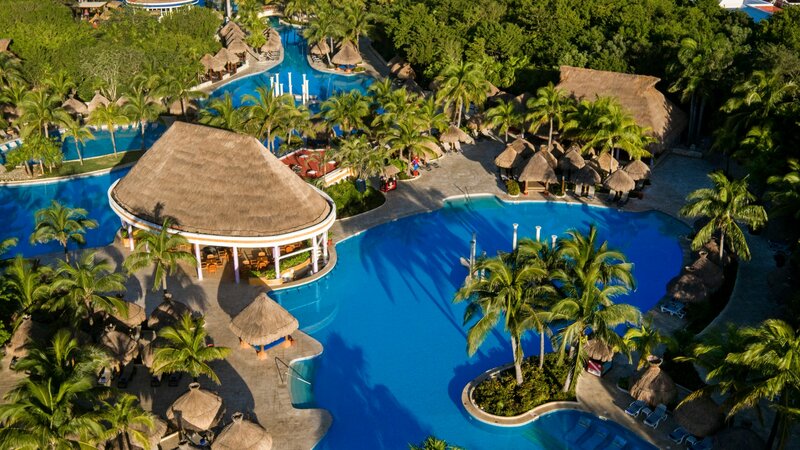 Luxurious Facilities: The Iberostar Paraíso Beach Hotel boasts one of the largest pools in the entire Mayan Riviera, over 3,280 feet in length! The pool area is furnished with Balinese beds and palm-thatched gazebos for relaxation. 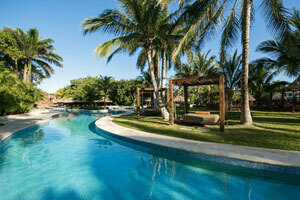 The Iberostar Paraíso Beach is undoubtedly a 5-star luxury hotel. Culinary Delights: The gastronomic delicacies offered at the Iberostar Paraíso Beach Hotel are an experience for all five senses. 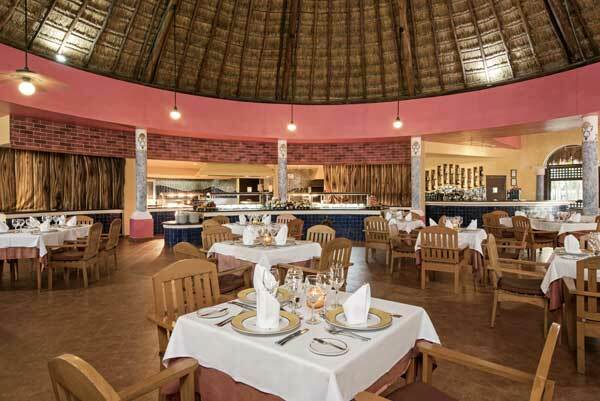 Our culinary expertise and variety of dining choices set us apart from ordinary all-inclusive hotels, from top buffets to à la carte restaurants serving appetizing Mexican fare and international cuisines. 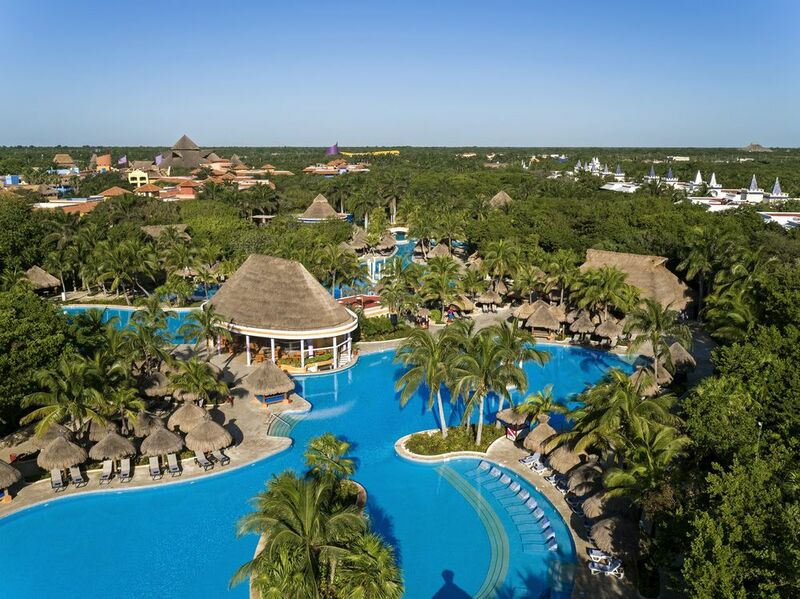 Caribbean Sports: Outdoor sports aficionados who enjoy being one with nature will be impressed by the Iberostar Paraíso Beach Hotel's multitude of sports and leisure offerings including an amazing first class golf course and scuba center, among other great activities. 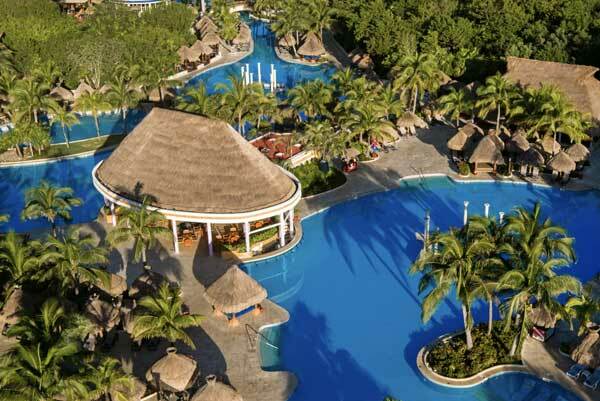 “Spectacular” only begins to describe the variety and quality of the entertainment and diversions awaiting guests at the 5-star all-inclusive Iberostar Paraiso Beach Hotel. Shows, games and all-night dancing at the disco will dazzle adults while kids will thrill to the most engaging activities and programs. The huge spa affords the opportunity to relax and heal mind and body. 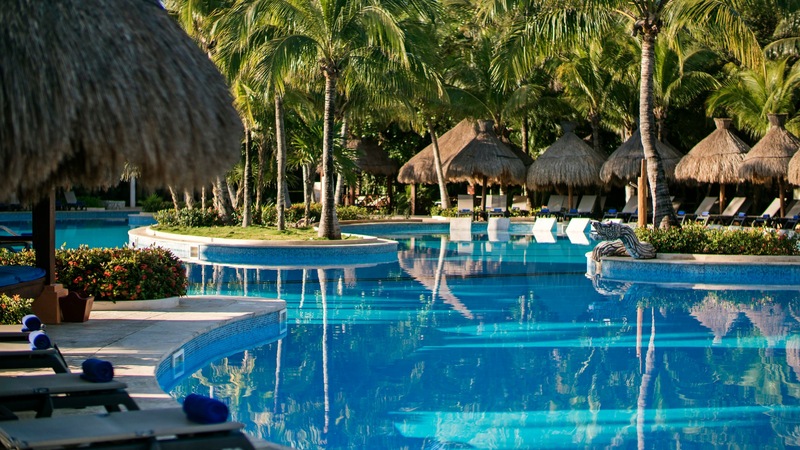 All the while, the tropical beauty of the Mayan Riviera provides a dream-like setting for a truly magical all-inclusive vacation for the whole family. Kids Club: The place to get together for organized games and free play. Hours: 10:00 AM-5:00 PM. For children 4-12 years old. Kid’s Pool: A place to swim just for the youngsters. Hours: 8:00 AM-6:00 PM. For children from 4-12 years old. Mini-Discotheque: Where the young set can mix and dance. Hours: 8:00 PM-9:00 PM. For children from 4-12 years old. Carrousel: Have a ride on a painted pony. Hours: 6:30 PM - 9:30 PM. DJ Lesson: Learn to mix like the pros. Hours: Moday. 10:30 AM. For teens from 13-17 years old. Galaxy Disco: Mix and mingle out on the dance floor. Hours: 8:00 PM-10:00 PM. For children from 4-17 years old. Dance Classes: Learn all the most popular steps and enjoy dance classes. Hours: 4:30 PM - 5:00 PM. Pool Games: Why let the kids have all the fun? Hours: 12:00 PM. Theatre: All sorts of entertainment including musical reviews, magicians and more. Hours: 9:30 PM-11:00 PM. Karaoke: You’ll do it “your way.” Hours: Mondays and Thursdays: 9:30PM-11:30PM. Open to adults 18 years of age and older. Galaxy Discotheque: Fabulous cocktails to keep you going as you dance the night away. Hours: 11:00 PM - 3:00 AM.For adults 18 years of age and older. 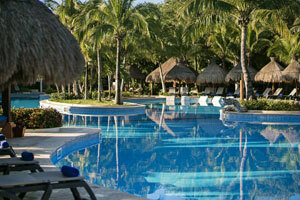 For sports lovers, the 5-star all-inclusive Iberostar Paraiso Beach has got it all. 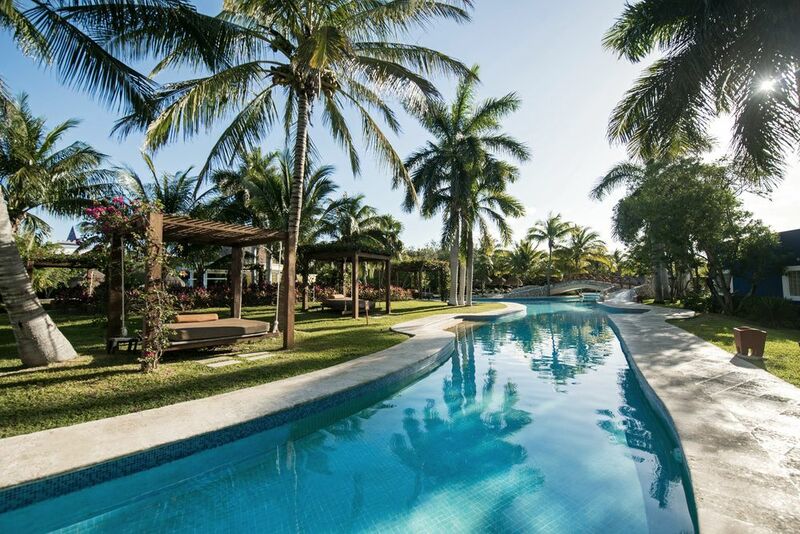 Dive and snorkel on a breathtaking world-famous reef, sail and surf over the waves of the turquoise Caribbean, golf a jewel of an 18-hole course or relax and tone with yoga and a fully equipped health club. Kids and adults alike will be thoroughly challenged and engaged day and night. Golf: Hone your skills on this fabulous 18-hole professional course. Additional charges apply. Hours: 6:30 AM-4:30 PM. Reservations: Required. Tennis: Enjoy hitting a few balls with a friend and with personal training. Tennis courts available 24 hours. Hours: 8:00 AM - 10:45 AM with Instructor Monday-Saturday Reservations: Required. Fitness Center: A fully equipped workout area with the latest equipment and weights to stay in shape. Hours: 6:00 AM - 7:00 PM. Archery: Try an ancient sport that really develops good hand-eye coordination. Hours: 2:00 PM - 4:30 PM. Beach Sports: Nothing like “soccer or volleyball” on the sand to work up a sweat. Hours: 3:30 PM - 4:30 PM. Bicycle Tour: Go for an relaxing healthy ride and enjoy the scenery. Hours: 9:30 AM - 4:45 PM. Riflery: Better your throw and concentration. Hours: 10:00 AM - 12:30 PM. Ping Pong: Fast and furious or a relaxed back and forth, it’s a perennial favorite. Hours: 10:30 AM - Tuesday, Thursday, and Saturday. Kayaking: Have fun challenging the waves. First hour is free, additional charges incurred afterwards. Hours: 8:00 AM - 5:00 PM. Snorkeling: Explore an entire ecosystem in just a few feet of tropical water. First hour is free, additional charges incurred afterwards. Hours: 8:00 AM - 5:00 PM. Scuba Diving: Diving Center run by Dressel Divers located right on the beach of the hotel. International Certified instructors, dive safely in comfortable boats designed for diving. Catamaran: Experience the majesty and speed of these beautiful boats. First hour is free, additional charges incurred afterwards. Hours: 8:00 AM - 5:00 PM. Windsurfing: Learn how to ride the waves with this thrilling sport. First hour is free, additional charges incurred afterwards. Hours: 8:00 AM - 5:00 PM. Pool Sports: Reap the benefits of an incredible water workout with waterpolo, aqua gym, water volleyball and water basketball. Hours: 11:00 AM. 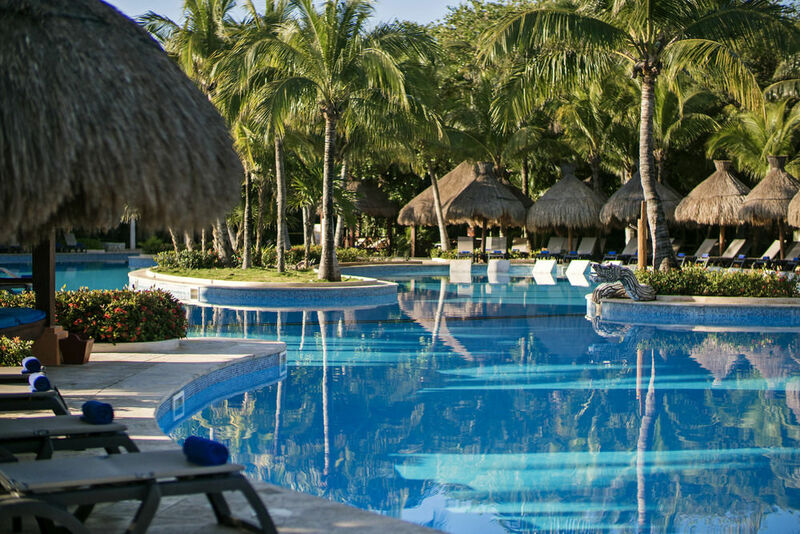 A dedicated team of professionals at the all-inclusive 5 Star Iberostar Paraiso Beach is eager to provide guests with the all the conveniences and services to ensure that a vacation with us is as flawless as possible. Concierge: Eager and knowledgeable, ready to help make the most of your stay. Hours: 7:00 AM-11:00 PM. Room Service: Enjoy food and drinks in your room. Hours: 11:00 AM-11:00 PM. Gratuities & Taxes: All tips and taxes are included, so there’s nothing to worry about. 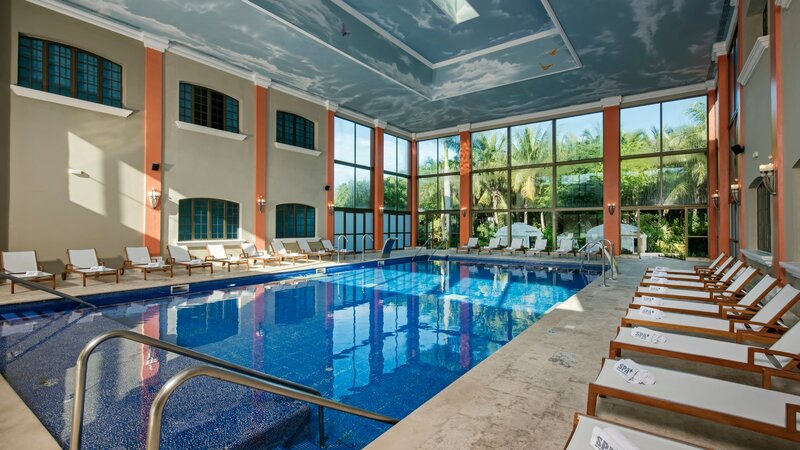 Pools and Jacuzzi: Perfect for soothing your muscles after a workout. Located in the pool. Hours: 8:00AM- 7:00PM. 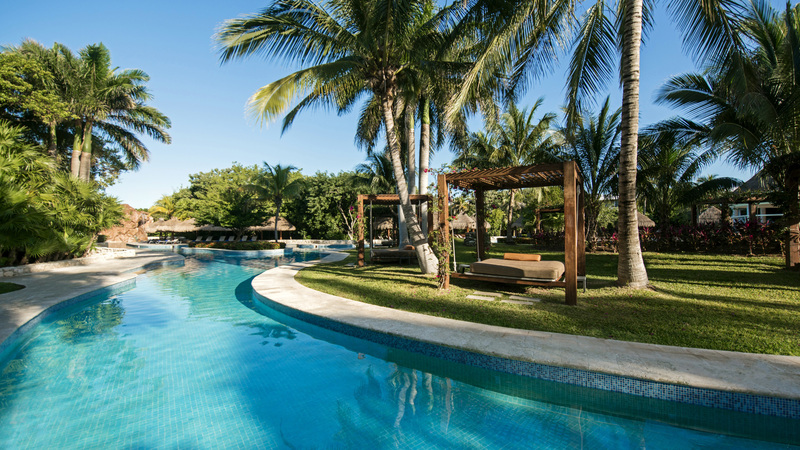 Palapas and Beach Lounge Chairs: Lie back in complete comfort. Available 24 hours. SPA Sensations: Pamper yourself with a full range of spa services including massage, facials and therapies that calm and soothe. Additional charges apply. Hours: 8:00 AM-8:00 PM. Reservations: required. Shopping Center: From souvenirs to sundries and everything in between. Additional charges apply. Hours: 9:00 AM-9:30 PM. Medical Service: Enjoy your vacation with peace. Additional charges apply. Hours: 24 hours a day. Pharmacy -10:00 AM-10:00 PM. 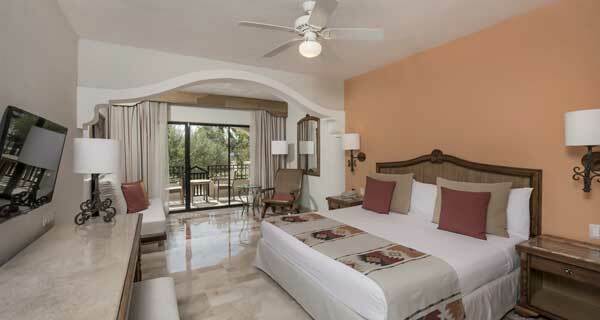 Starmarket: Exclusive Iberostar products are on offer as well as conveniences and sundries.Additional charges apply. Hours: 9:00 AM-9:00 PM. Babysitter: Happy to look after the little ones for you. Additional charges apply. Hours: 24 hours a day. Reservations: Required. Discover all natural treatments to rejuvenate your mind and body, heal aching joints and muscles and relieve accumulated stress. Whether you are looking to restore your skin’s natural balance or for a couples massage you will be able to find complete relaxation at our modern caribbean spa. Deep cleansing regimens, essential oil treatments, hydro massages and beauty services await you. Imagine a beautiful postcard landscape surrounded by nature, exotic wildlife, and ancient ruins. 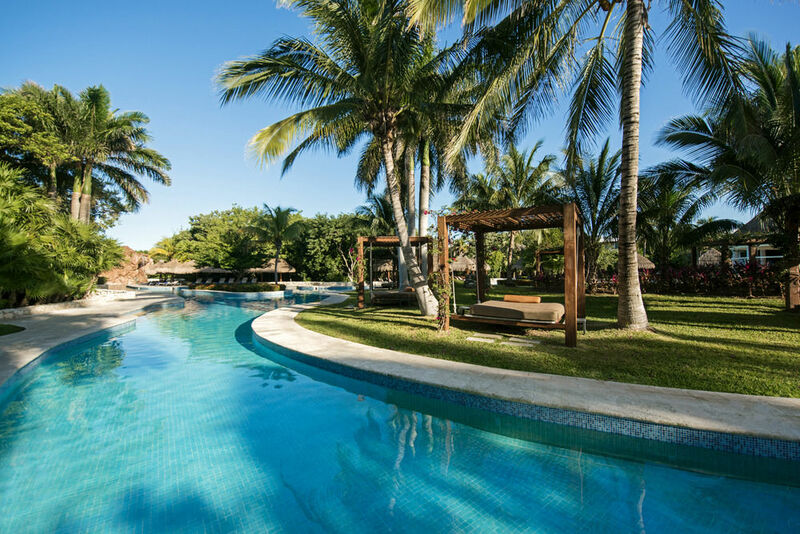 Playa Paraíso is an extraordinary location where the gentle sea breeze, the warm sun, the lush jungle vegetation, and world-renowned archeological landmarks are very real.